Putting away leftovers is quite easy thanks to tin foil. 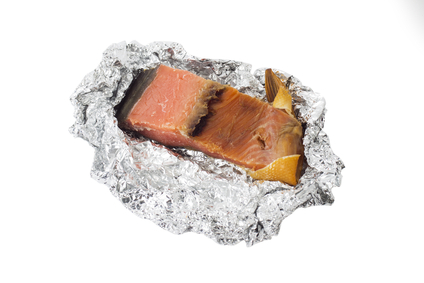 The moldable foil has a wonderful reputation of storing even the messiest of foods in a nice package in the refrigerator or freezer. But is this tin wrapper a healthy way to store food? While some people believe aluminum foil to not be healthy as a small percentage of studies have shown that roughly 2 to 6 milligrams of aluminum was found in foods that were stored or cooked in the foil, a majority of the research done on the storage wrapper has concluded that tin foil is in fact safe to cook with and store food in. There has been much concern over the fact that aluminum has neurotoxic properties but there has been no direct link to neurodegenerative diseases. Along the same lines, aluminum has been thought to be a carcinogen, but, the U.S. Department of Health and Human Services’ National Toxicology Program sings a different tune, stating that aluminum foil will not increase a person’s cancer risk. With your concerns now at bay, why not enjoy a phenomenally flavored recipe in which you pouch up delicious ingredients, throw the package on the grill, only to unwrap it later to find the most fantastic “present”. You most likely will not need aluminum foil to store the leftovers because this recipe is so good, you will eat it all! Read about how our all natural detox foot patches function.